The smash hit West End musical GHOST the Musical, based on the Academy Award winning film,will be at The Edinburgh Playhouse from 14th May – 1st June.GHOST the Musical is directed by the Tony award winning Matthew Warchus (Matilda,Art) and has music and lyrics by Grammy® award winning Dave Stewart (Eurythmics) and Glen Ballard and features the iconic songUnchained Melody. Set and costume designs are by Rob Howell, musical supervision and arrangements byChristopher Nightingale, illusions are by Paul Kieve, choreography is byAshley Wallen, video and projection designs by Jon Driscoll, lighting byHugh Vanstone and sound by Bobby Aitken. The UK tour is being produced byDavid Ian Productions, The Ambassador Theatre Group, Colin Ingram,and Hello Entertainment/David Garfinkle. Full casting for the tour will be announced later this year. Oscar®winning Bruce Joel Rubin adapted his original screenplay for the stage production. Rubin won anOscar® for Best Original Screenplay for the movie GHOST, which starred Patrick Swayze, Demi Moore, Tony Goldwyn and Whoopi Goldberg. Based on the phenomenal Oscar® winningmovie that captured the hearts and imaginations of a generation back in the 90s, GHOST the Musical is a timeless fantasy about the power of love. Sam is trapped as a ghost between this world and the next trying to communicate with girlfriend Molly through a phoney psychic in the hope of saving her from his murderer. 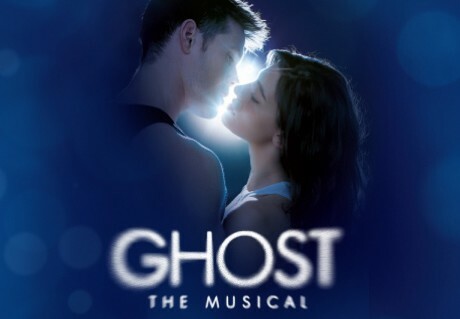 GHOST the Musical is a rollercoaster ride of romance and comedy with dazzling state-of-the-art staging.